Central government of India has initiated a new program for Uttar Pradesh’ school students. ‘Right to Light’ program states that each school student will get solar power light to study in the night. The scheme has started initiating in other 5 states as well excluding UP. The list of states include Bihar, Orissa, Jharkhand and Assam along with UP. 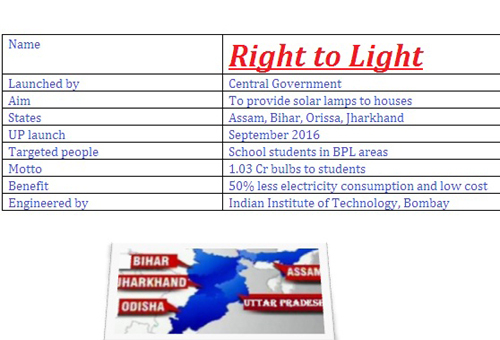 Right to Light Program is one such scheme by the central government where school goer students will get solar powered lamps for their study purpose in the evening or night. The program will be launched in UP soon whereas the program has already launched in the states like Assam, Bihar, Orissa and Jharkhand. In this program the central government along with state government have decided to distribute 1 Cr. solar lamps to the students. This scheme will be engineered by the Bombay IIT engineers and technical department. The program will be implemented in the state Uttar Pradesh. The scheme has already started in some of the Eastern States as mentioned above. At the first place the central government had stopped the implementation of the program in UP because of some political rift. In a recent event it was announced that soon the program will be launched in UP. Indian Institute of Technology, Bombay has a major part in this scheme as the engineers and technical department have joined their hands with the central government to implement the scheme. The HOD of the energy department of IIT Bombay has stated that areas which are still living behind in case of electricity and basic amenities will be the main target for the scheme. Students from the backward areas will get the facility of the scheme. The ‘Right to Light’ scheme will be launched officially in UP this September. The official date is still not announced though. But the central and UP state government has said the scheme will be in action from the month of September this year. The scheme will be implemented in a similar way like the state government of UP has implemented their own solar power electricity scheme. Under the state government scheme the UP government has provided bulbs of 3 and 5 watts respectively, ceiling fans (DC) and also mobile phone charger points in the BPL houses across the state. Similarly this right to light scheme will be implemented in the state. The central government has aimed to distribute nearly 1 Cr. Solar powered bulbs to the students who fall under BPL. Also they will distribute the lamps to those houses where basic amenities are yet to be reached. In case of budget the government said that the students have to pay for the bulbs. These bulbs will not be provided as free of cost. But the cost will be much lower for the students whereas the Ministry of New and Renewable Energy has to bear the remaining cost of distribution and bulb manufacturing. On the other the central government has declared that they might not include UP government in this scheme as UP government already depicted that they have witnessed Rs. 13, 000 Cr for several schemes.